Here at WhatShed, we’ve made it our mission to guide would-be garden building buyers to their dream cabin or shed. We base our extensive reviews on our many years’ experience in the garden building industry, as well as real-world site views to manufacturers’ showrooms. 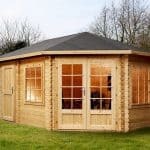 Today, we’ll be looking at The Amur 44mm log cabin by TigerSheds. First impressions of the structure are strong. The Amur is a good-looking cabin with a spacious, built-in porched veranda area. The roof is a reverse apex roof shape, which creates a vast space within, complete with room for copious internal storage. Although we weren’t actually able to see The Amur itself at the TigerSheds’s showroom in Leeds, we have personally inspected The Shere, The Procas, and The Rho ranges of cabins, which share many of the same construction methods and materials at The Amur. We can therefore assume that The Amur will be finished to the same high standards as the other premium cabins in the 44mm range. Some might find the interior gloomier than other 44mm cabins by TigerSheds. 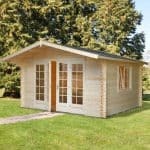 The Amur log cabins are available in a total of six different sizes. These are all detailed in the table below. However, since the timber comprising the structure is milled by TigerSheds themselves, the cabin can be ordered in a custom size, at an additional cost. Thanks to its reverse apex roof, The Amur stands at an impressive 2616mm at its tallest point. This is great since it allows for lots of headroom and storage space within. However, certain planning regulations dictate that garden buildings less than 2m from a house must be lower than 2.5m tall. Fortunately, TigerSheds will reduce the height of The Amur to remain compliant with local laws. This service is provided free of charge too – not something offered by every cabin manufacturer and certainly something that speaks loudly of TigerSheds’s commitment to customer satisfaction. The timber used on The Amur is all slow-growing European redwood. 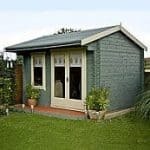 This choice certainly isn’t the cheapest but the decision to offer such a durable material as standard inspires confidence in the buildings sold by TigerSheds. We liked that TigerSheds proudly announce the specific wood they use. This isn’t something that every manufacturer does, and we often find that those omitting such a detail build with inferior woods, such as Baltic white. Whilst certainly cheaper upfront, such faster-growing woods are prone to warping or splitting. TigerSheds obviously want their customers to be able to enjoy their purchase for many years and their choice of timber reflects this. As mentioned, we also like that TigerSheds mills its own wood. This allows for a far greater level of quality control versus manufacturers who might source their materials from third-parties. The timber used for the Amur is also cut to order, which means there is less chance of components being stored in sub-optimal conditions whilst waiting to be bought. In terms of treatment, TigerSheds recommends coating your newly-erected cabin within 14 days of construction. Realistically, however, you’ll want to get a layer of a protective product on it as soon as possible. 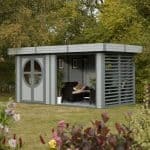 For this task, TigerSheds provide two different products – their own TigerCare and Cuprinol Garden Shades. The company’s own product is available in Clear, Dark Oak, Mahogany, and Red Cedar. Meanwhile, the treatments from Cuprinol are offered in a range of slightly fancier colours – Black Ash, Forget Me Not, Old English Green, Pale Jasmine, Seagrass, Summer Damson. 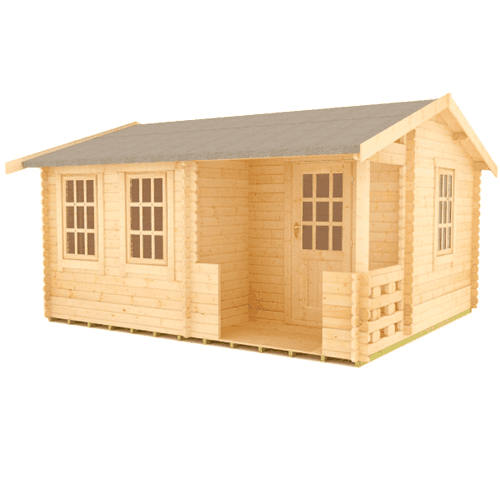 TigerSheds have opted to go with 44mm walls as standard across its entire range of log cabins. This design choice once again signals the firm’s commitment to quality. Some cabin manufacturers will cut corners here and choose to offer a thinner wall. 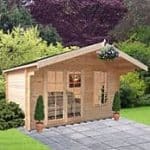 This might save the customer a few quid in the short-term, but the quality of the cabin will be far lower than those constructed by TigerSheds. The walls themselves are built using a four-way notch system and cladded using tongue and groove boards. We have seen manufacturers cut corners here and attach cladding using the shiplap method. However, the resulting cabins, although often cheaper to buy upfront, simply cannot offer the same rock-solid feel and superior resistance to the elements as The Amur. Just to be on the safe side though, TigerSheds includes storm bracing on its 44mm cabins. These are essentially additional supports that bolt the structure together even tighter to make it better able to withstand all that a British winter can throw at the building. Storm bracing as standard isn’t a universal feature across every log cabin manufacturer, making TigerSheds’s decision to include it all the more notable. Along with the superior construction methods, the walls have been exquisitely finished, adding considerably to the structure’s visual appeal. We particularly liked how each timber is notched along all edges. Although a small touch, the impact on the overall look and feel of the building is great. Again, it would have been cheaper for TigerSheds to forgo such detailing but the fact that they did not shows the firm’s commitment to the highest quality. The Amur’s roof is a reverse apex design. This allows for maximum headroom inside the structure. Providing support to the 19mm tongue and groove connected roof boards are 44mm by 122mm timbers. We feel that that these construction choices are once again over-and-above what might have been considered acceptable by some manufacturers. The result is a sturdy, weather-resistant roof that will surely protect the cabin’s dwellers for many a year to come. In terms of covering, The Amur comes with heavy-duty mineral felting as standard. We were impressed with the quality of this entry-level option on both The Shere and The Rho log cabins we inspected in Leeds so are pleased to see it included here too. 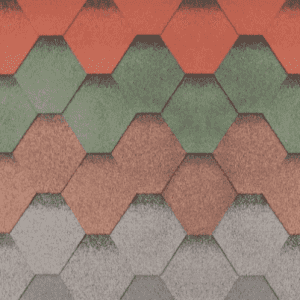 Although the mineral felt is perfectly adequate, a touch of extra style can be added to The Amur with an upgrade to roofing shingles. These are available in four colours – red, green, black, and brown. Further customisation can also be achieved by adding guttering, for an additional cost. TigerSheds even predrills the 14’ lengths meaning installation takes just a few screws. Log cabin flooring is something that some manufacturers like to skimp on. We’ve even seen some examples where the price listed is for a building that comes without any floor whatsoever! We’re happy to report that this is not the case with TigerSheds. Once again, the firm proves its commitment to providing top quality garden buildings by including a 19mm floor as standard. Fitted together using tongue and grove, the floor sits on a sturdy 58mm by 44mm tantalised and pressure-treated frame. This provides both exceptional support to the structure, as well as damp-resistance. The Amur’s floor is actually the same of The Shere and The Procas, which we saw in Leeds. There wasn’t a bit of give underfoot in either cabin, despite how heavy-footed we were intentionally being whilst viewing them! Although the floor offered as standard was easily hardwearing enough for even the roughest day-to-day abuse, TigerSheds will provide an upgrade for an extra cost. We would probably recommend those wanting to use The Amur as a workshop to consider such an addition. The standard edition of The Amur comes with Georgian style single doors and windows. Although adding to the building’s “comfy cottage” aesthetic, the pictures on the website do make the cabin’s interior look quite dark. Naturally, this is purely a matter of taste. It can be argued that the more secluded atmosphere, created by the lower lighting, gives The Amur a bit of a “cabin-in-the-woods” feel. Others might find it dingy or claustrophobic. We recommend those put off by the lack of light to consider one of the window and door upgrades detailed below or to read our review of The Procas – which has absolutely massive windows. Opinions on natural light in cabins aside, the Georgian windows and doors on the entry-level model are rather special. Clearly joiner-crafted, the extra wood used to create the frames for individual panes gives TigerSheds’s superior craftsmen a lot of room to shine. 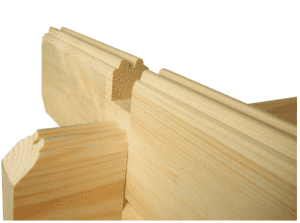 The high level of quality continues when it comes to the frames themselves, which feature tasteful architraves – a nice touch not always seen on garden buildings. As mentioned, The Amur cabin’s windows and doors can be upgraded. The sales module lists that Euro style, full pane toughened (certainly worth considering for those wanting a lighter Amur), and PVC are available. In its non-upgraded form, The Amur comes with 3mm glass. Both 4mm toughened glass and double glazing (two 4mm panes with a 6mm gap) can be included at a cost. We do, however, find the entry-level glass to be more than adequate in terms of both security and insulation. Some manufacturers will save themselves a little here by using thinner glass, or a lot, by not using glass at all. Not so with TigerSheds! As the doors and windows to a cabin provide the access points, now is as good a time as any to discuss security. TigerSheds have not gone for the cheap option in terms of locks. The building features mortices locks as standard, with the option to upgrade to a five-lever lock. In addition, customers can add various alarm and security light configurations too. TigerSheds really excels when it comes to delivery. The company not only provides a full professional delivery as standard, it does so with its own staff and equipment. The Amur will be dropped off at your chosen location in most of the United Kingdom (check the website for precise areas excluded) within a two-hour time period of the customer’s choosing by an 18-ton truck and crane. We’ve heard reports of some manufacturers delivering cabins by hand, which is surely inviting a much higher chance of damaging the components during the process. The fact that TigerSheds takes responsibility for this part of the services themselves and use heavy machinery to assist makes such mishaps considerably less likely. 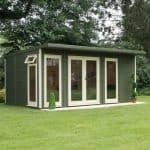 Although TigerSheds products have been built to be as easy to erect as possible, the firm does offer an installation option. This is ideal for older customers, those who don’t have the time to do it themselves, or those with mobility issues. Alternatively, those who lack DIY confidence, and would rather the manufacturer take responsibility for the build might find the service appealing. The Amur from TigerSheds is another one of the firm’s 44mm range that we just loved. Ultimately, all these cabins are built to an exceptionally high standard and a beautifully finished. That said, we particularly enjoyed this garden buildings quaint cottage look, its spacious interior, and its veranda area. Being so well-built, it’s difficult to find much to dislike with TigerSheds’s Amur log cabin. The only real quibbles we had were that there was no treatment included in the price and that the installation is rather costly. Some might also take issue with the size of the amount of light the windows and single door let in but we actually found it rather cosy inside. The building itself might not be the cheapest around but even with the standard edition and no upgrades, you will be getting an amazing quality structure that will give you joy long into the future. This isn’t consistent with every manufacturer and we were pleased to see that, aside from a bottle of treatment, if we paid the lowest asking price for The Amur, we’d receive a cabin that was built to stand for many years.